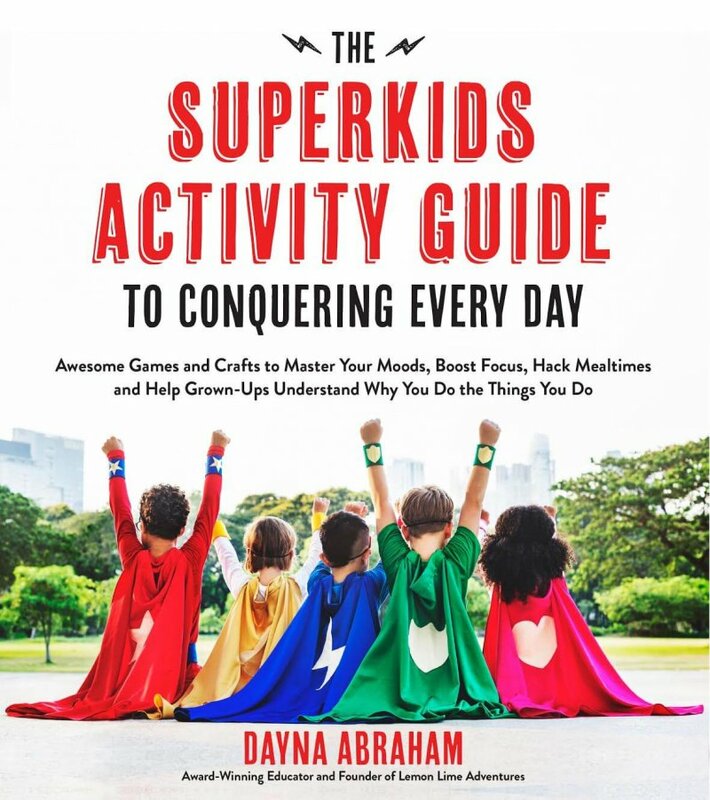 When my son was four years old, he spent months planning his birthday party. He was set on a Halloween theme, despite it being a July birthday. This was eight years ago and my son’s love for Halloween has not faded in the slightest. Forget the fact that Halloween was still more than a month away, I couldn’t resist. We added the pumpkin to our cart and waited for the perfect reason to carve it. That’s when my son’s love for Halloween collided into his love for Star Wars. He would carve the pumpkin into one of his favorite characters and all would be right with the world. 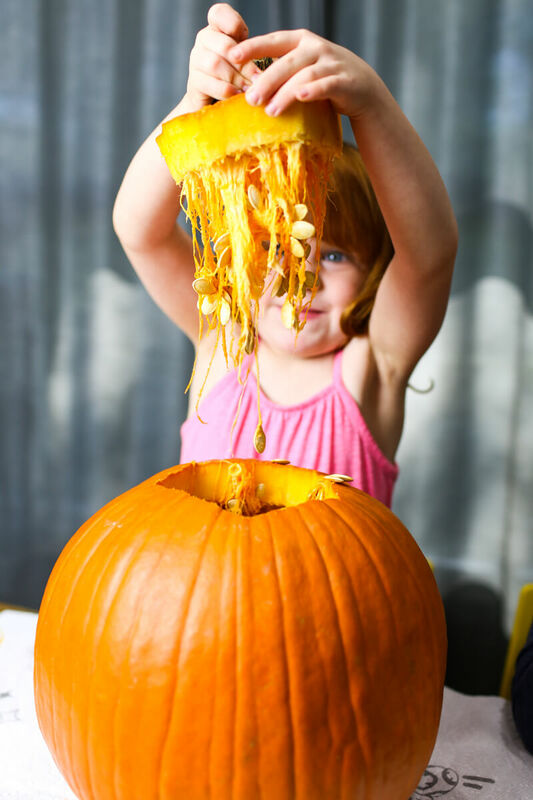 The only problem… we had to clean out the pumpkin first. Now, I’m not sure how we went from Halloween to Star Wars to slime but this was the natural progression for us. 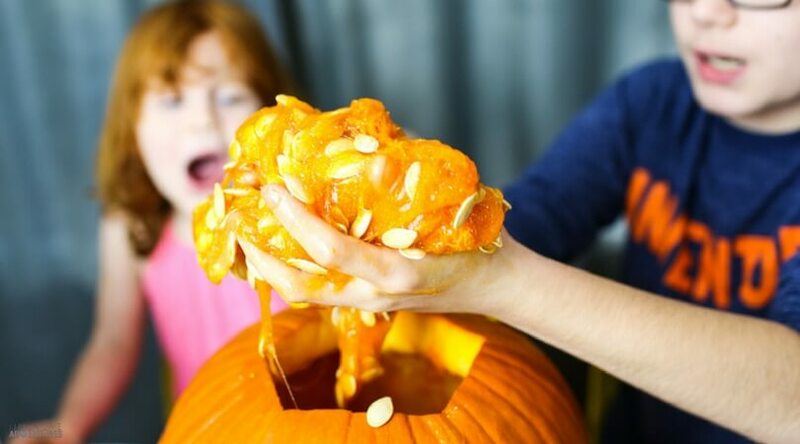 We figured since we had the pumpkin open, this would be the perfect chance to try our hand at some ooey, gooey pumpkin slime. We partnered with our friends at Bounty to take care of the mess for us, so we could spend our time making memories. 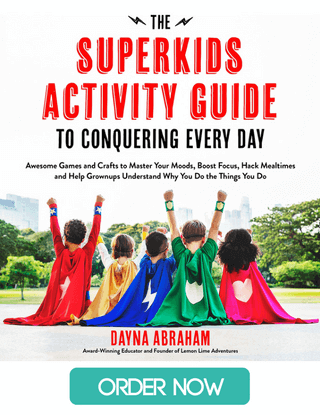 Making slime is something we just “do” around here. Almost every week, we have a new slime or experimental gooey recipe we are testing out and getting our hands in. 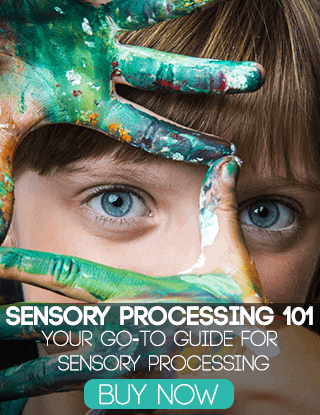 My oldest is usually tactile defensive, but when he gets in the mood to get messy, we run with it all the way. Today was one of those days. 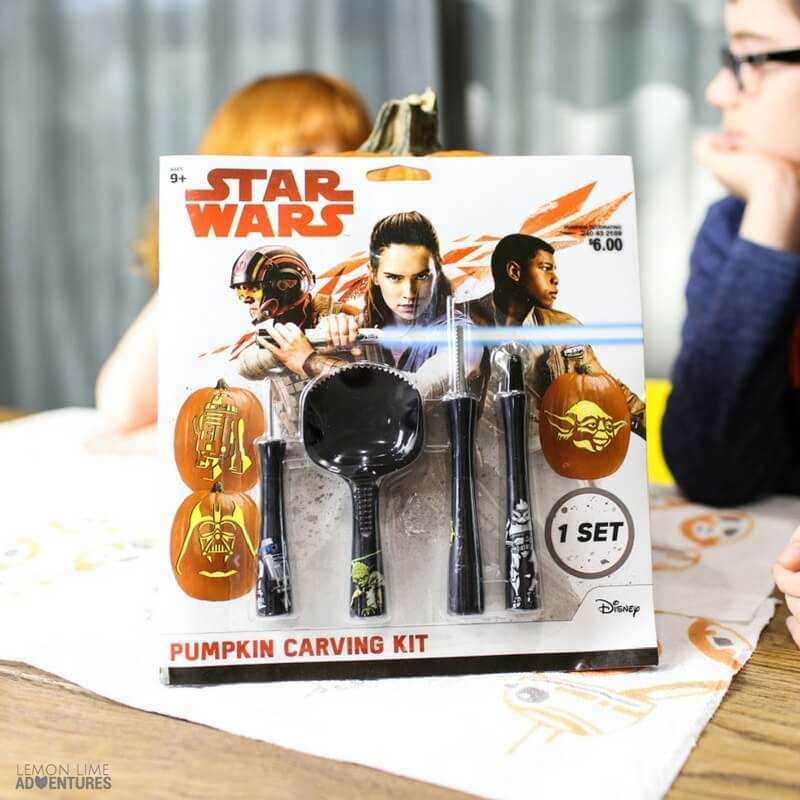 Our friends at Bounty sent us this awesome Star Wars carving set, which made cutting the top off and getting to the seeds super easy for my son to take charge. 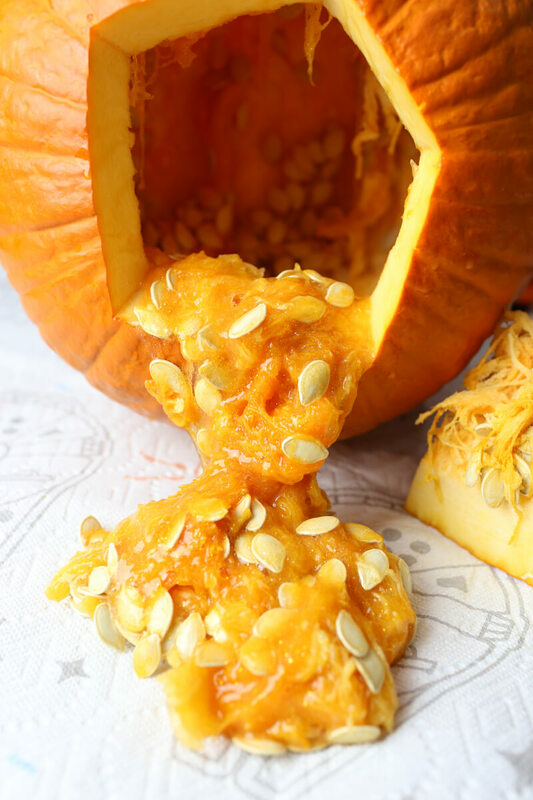 First, we needed to get the seeds out of the pumpkin, then we would be ready for some ooey gooey fun. We lined the table with our new Star Wars prints from Bounty and got to digging. 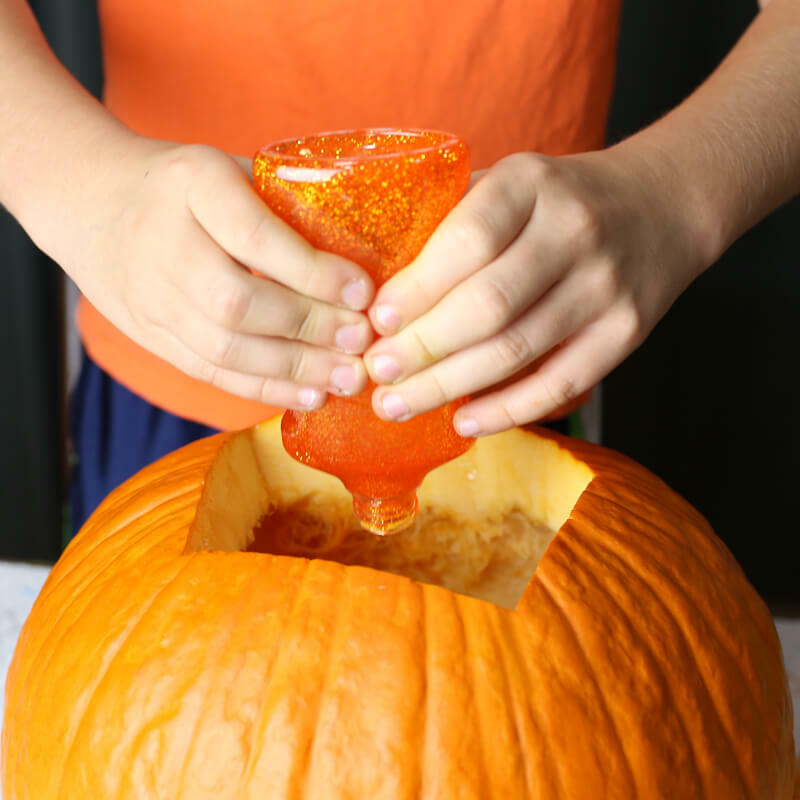 The goal is to keep as much of the pulp and seeds from the pumpkin inside the pumpkin to use in the slime. The best thing to do is scrape everything from the side and swish your hands around until all the seeds are loose. Finally, we were ready for the ooze. 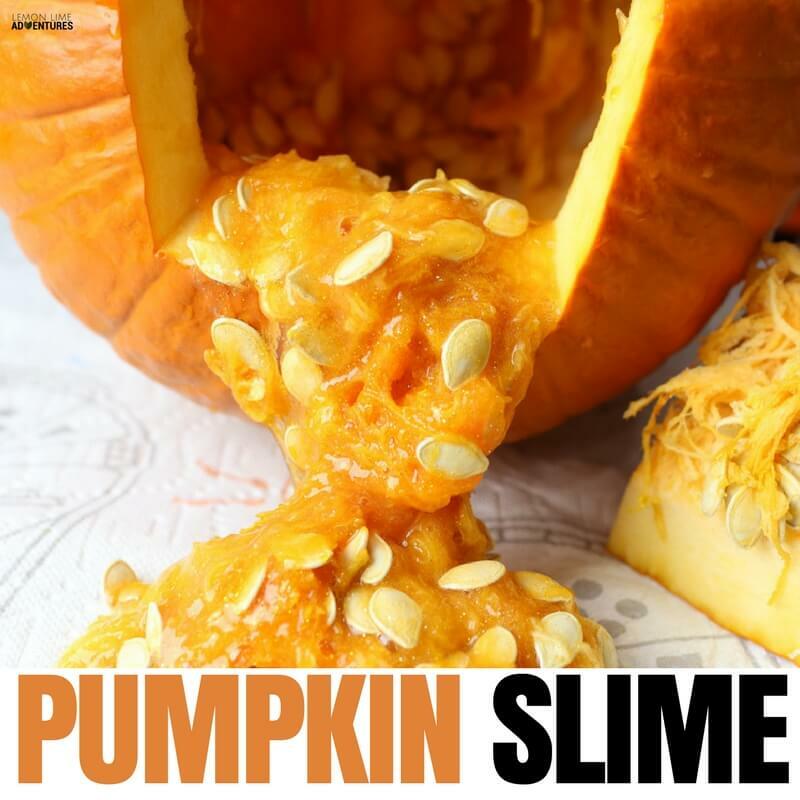 Pumpkin slime is actually pretty straight-forward and simple, it uses our simple slime recipe as the base. 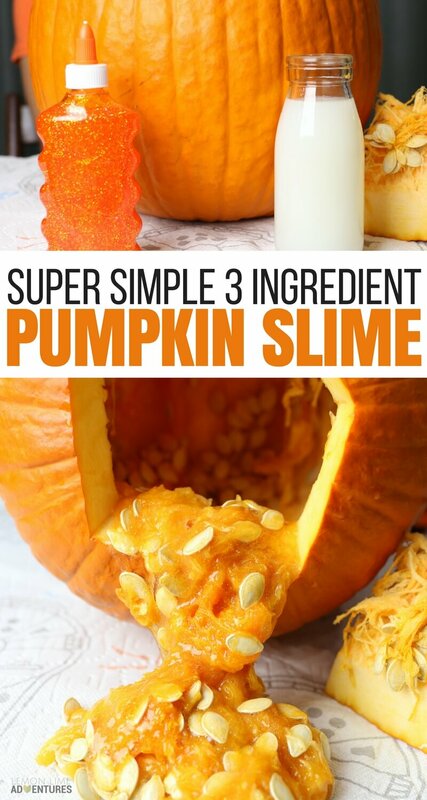 Once you have cut open the pumpkin, it’s slime time! 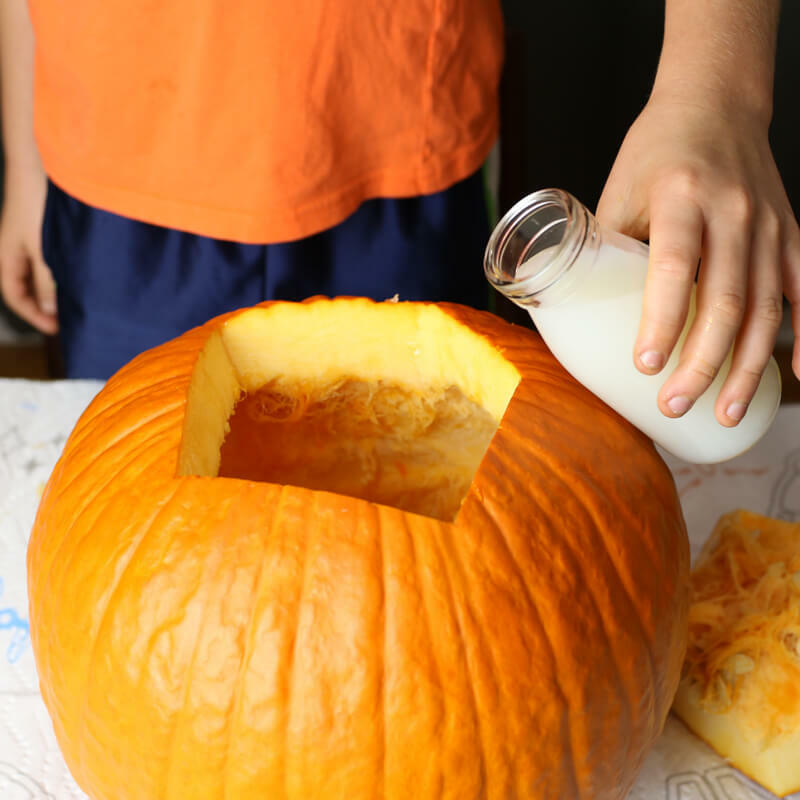 Seriously, we ended up using half a roll of paper towels, but that could be that my kids went elbow deep in the pumpkin once we got started. 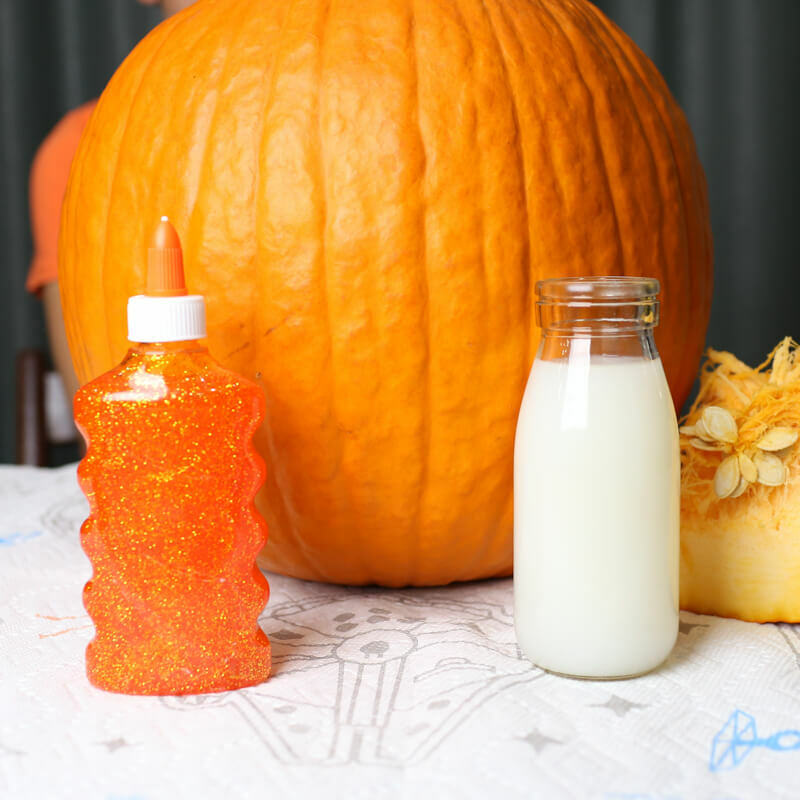 Start by pouring 2 bottles of glitter glue into the belly of the pumpkin. You can do half the recipe, but we wanted a lot of ooze to play with later. Next, slowly pour in the liquid starch while mixing at the same time. 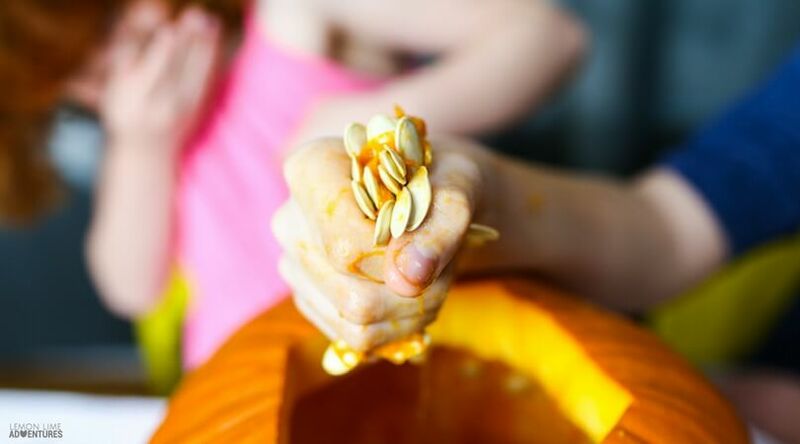 If we didn’t have our hands in a pumpkin, this would be much easier. However, do your best to stir and pour at the same time. 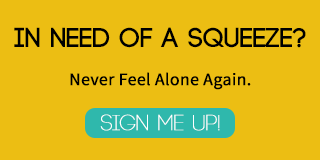 You might find that your hands do the best job of getting the slime to mix and turn into slime. “Mom, its the belly of a Taun Taun.” I am supposed to know what this is. “Honey, you know, a Taun Taun. It’s where Luke took shelter in The Empire Strikes Back.” My husband was now in on the conversation too. Super B and I just thought it made pretty cool slime and were amazed at how well it worked. Now it was time to play!!! 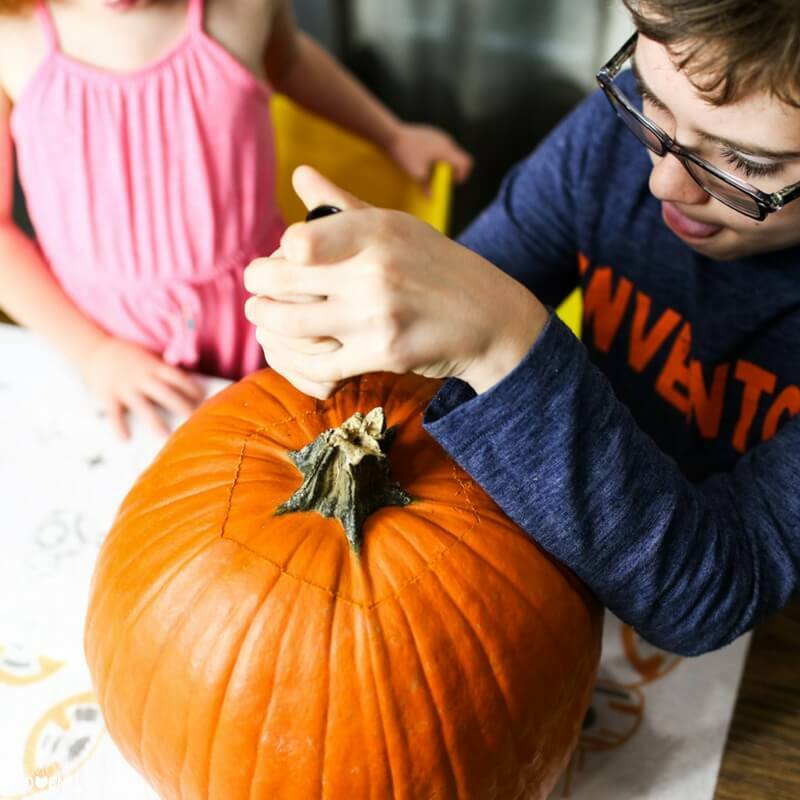 We got out our new Star Wars characters from the new movie and our Play-Doh Star Wars AT-AT Attack™ set and we were ready for hours of fun… with our pumpkin slime. cave while Kylo Ren tried to find Rey with no luck. big brother tried to impart the plot lines into her. 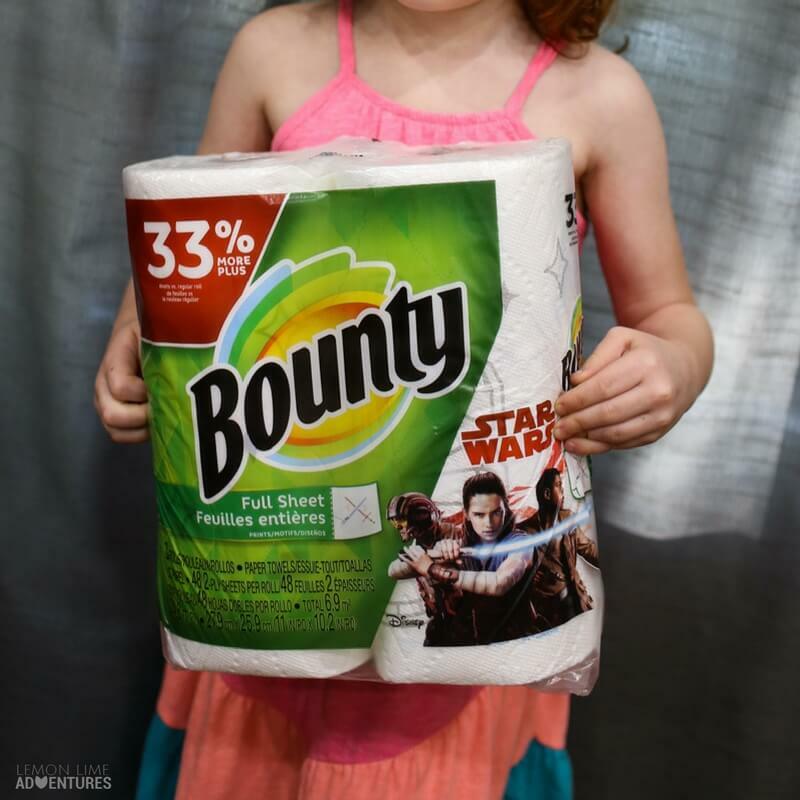 As for all those paper towels, let’s just say Bounty held up their end of the bargain and took care of the mess so we could make memories and have fun! Also, I scored some mad “mommy bonus points” because I had paper towels to match our playtime. Who doesn’t want to clean up when BB-8 and light-sabers are involved?